The analysis of solid materials by introducing solid test sampies directly into the graphite furnace of an atomic absorption spectrometer must be regarded as a powerful analytical approach. Even if it is - of course - not the "ultimate method". After three decades of development, the instrumentation and the methodology are available to apply solid sampling successfully for the analysis of almost every material. 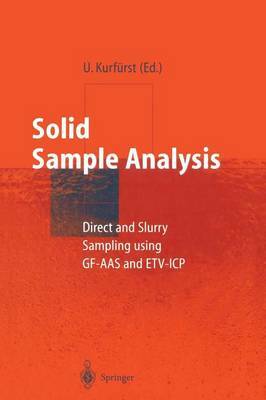 Moreover, several tasks cannot be solved using other analytical methods as neatly as they can using direct solid sampling. The conventional methods work more or less satisfactorily, so why do we sug- gest applying solid sampling much more extensively than it is today? To begin with, the features pointed out time and again should be named: Rapidity of the analytical procedure, low susceptibility to analyte loss or contamination, very smallquantities can be analyzed, and expenditure on instrumentation and per- sonell is also low. These properties are examined and the necessary conditions are discussed (Chapter 1) as are the analytical tasks (Chapter 6) for which use of this method is advantageous. Other features that are often overlooked are just as important: The simplicity of the analytical procedures allows the analyst to main- tain an intimate relationship with the original scientific task that has to be solved with the analysis. Furthermore, the considerable reduction of working place haz- ards and pollution by avoiding the use of chemical reagents must nowadays be assessed as a feature as important as the others.